I can’t take credit for that slogan. The first person I saw use it was @QweenofDiamonds on twitter (who blogs on the O’s at the awesome I Hate JJ Redick). I’m happy to jump on board though. As any long-time reader knows, we are 100% Team Reimold here at the Nest. While Nolan had a fielding gaffe in the Royals’ 4-run second inning yesterday, he more than made up for it with his bat, going 4-for-4, with two home runs, 4 RBI, a walk, and scoring two runs in yesterday’s 6-5 win. Watch his whole day here. In 11 at-bats since being called up from Triple-A Norfolk, Reimold is already half way to the team lead in dingers (currently 6) with three. He also has six RBI, and is slugging a ridiculous 1.455. Now, obviously Nolan won’t keep up his torrid pace. However, even if he matches his 2009 production of .279/.466/.831 with 15 HR, the year has to be considered a success. After his terrible 2010 – and very mediocre time at Norfolk through two months this year – many were beginning to worry that 2009 was indeed a fluke. 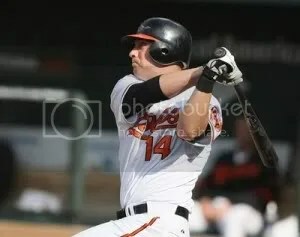 While he’ll need to remain on the MLB club for the rest of the season and continue to produce if he wants to truly put those fears to rest, Reimold’s first few days of action with the O’s have been extremely encouraging. He should be in the lineup every day – if that means less at bats for Felix Pie, it’s a trade off I’m willing to make. If it means Vlad Guerrero and/or Luke Scott are dealt – that’s also acceptable. Let’s keep Rollin’ with Nolan. Give him a chance to prove he really belongs…or doesn’t. I’ll be cheering – loudly – for the former. This entry was posted on May 27, 2011 at 12:39 pm and is filed under Orioles. You can follow any responses to this entry through the RSS 2.0 feed. You can skip to the end and leave a response. Pinging is currently not allowed. Correct. What’s not a small sample size is HIS ENTIRE CAREER EXCEPT 2010. Did Megan make you write this?